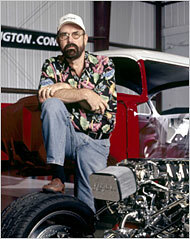 I guess most of you have heard by now about the sudden loss of the great hot rod builder Boyd Coddington who sadly passed away on Wednesday. The automotive world has truely lost one of the great ones.. The best of the best started out working for/with him...including Jesse James and Chip Foose.. He certainly was one of a kind and will be missed by many who ,like me, greatly admired his work.